Work Log: Ukraine: "Ashes of the Freedom of Speech"
Ukraine: "Ashes of the Freedom of Speech"
A few hundred people gathered [uk] at Kyiv's Independence Square on Sept. 16 to honor the memory of Georgiy Gongadze, a Ukrainian journalist who disappeared on this day 12 years ago, and of more than 60 other journalists who lost their lives in the years since Ukraine gained independence in 1991. The participants of the memorial rally lit candles and stood around white paper boxes that had the names of the dead journalists written on them, as well as the words "honor," "honesty," "truth," and "freedom of speech" (photo [uk] by Andriy Balan/@Andriy7MU). Georgiy Gongadze memorial rally of 2011. Photo by Veronica Khokhlova. Later, they set the boxes on fire (photo [uk] by Andriy Balan/@Andriy7MU), and also burned posters [uk] with portraits of the ex-President Leonid Kuchma and his former aide, Parliament Speaker Volodymyr Lytvyn, who are believed to have played a crucial role in Gongadze's disappearance. 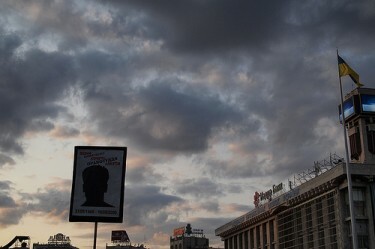 Leaving behind the symbolic "ashes of freedom of speech," the people then marched uphill from Independence Square to the Presidential Administration compound, to demand a proper investigation of Gongadze's disappearance case. [...] It's the evening when one is thinking, "God forbid that my friends become political journalists." The names of those who had died were read. [Was found] hung, burnt alive, traces of injections on the body, a [contract killing], knife wounds, head wounds... People should not be dying because they are doing their job well. People should not be dying because of their profession. Freedom of speech the Ukrainian way - to come and yell at the wall. But it's worth it to come and yell. At least to be able to hear yourself.